CRIME, GUNS, AND VIDEOTAPE: Take a Look at the Latest and Greatest Camera Armed, Unmanned Aircraft Drone! Take a Look at the Latest and Greatest Camera Armed, Unmanned Aircraft Drone! Las Vegas, NV—The National Association of Broadcasters are meeting in Sin City for among other things learn about the rapidly changing technology that brings breathtaking images to those very spectacular TV screens in most of our homes. These days TV news directors everywhere are faced with a financial crisis and thankfully the equipment they need has never been better or cheaper. The largest single expense for any newsroom is that exciting helicopter assisted newsgathering. Frankly, many medium and small market TV news organizations have had to eliminate helicopters altogether or enter into video sharing and cost splitting agreements with new competitors because they simply can no longer afford it. Helicopter safety is no small issue with too many deadly crashes and the related liability issues. Another problem is scrambling to get the helicopters quickly in the air when news breaks. The cost of the drones can be from $1,000.00 to $15,000.00 depending on the camera payload being supported. TV stations would be well served to obtain several of these drones that should be kept throughout their coverage area. The less expensive Camera Drones are perfectly adequate for broadcast quality newsgathering purposes. The larger ones are more suited for feature filmmakers. Certain reporters or photographers should be trained in handling these easy to use devices so they can respond quickly to accidents, fires or violent incidents. They can be deployed in mere seconds. In the Las Vegas or Phoenix metropolitan areas perhaps as many as nine drones in each news department would insure quick aerial response to any situation. This is only a fraction of the cost of operating a news helicopter. The captured video can be accessed through a USB port and quickly edited with industry standard software for news packages. The quadcopter camera industry leader DJI, is showing off their latest entry into the Camera Drone Race at the NAB Convention. 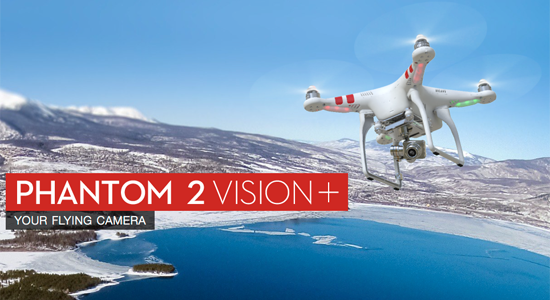 They just announced their Phantom 2 Vision Plus drone. This little gem can capture stunning video. It comes with a three degree stabilizing gimbal. That improved device holds the camera still in windy conditions or during tricky maneuvering of the drone. The camera shake or vibration is eliminated in this latest version. It really excels when panning or moving back and forth. The Phantom 2 Vision Plus works with modern smart phones to allow both monitoring of the video but to actually change camera settings like exposure while it’s in the air! The controller has a built-in wifi extender to give as much as a ½ mile range allowing the pilot to view exactly what the camera is able to capture. The Phantom uses rechargeable batteries that give it life for over 20 minutes, which would be sufficient for most situations. I’d recommend a second or even a third back up battery for each drone in your news gathering air force. There are endless uses for Camera Drones in entertainment or documentary filmmaking. Private investigators, real estate salespeople, roofers and farmers all have a need for this exciting technology. The new video drones are lightweight and very safe to operate. The liability issues are almost non-existent. I don’t yet own the DJI Phantom II Vision Plus since it just was announced. I do however have experience with the two earlier models that some friends of mine have let me use. They are terrific to say the least. I will be getting the newest one as fast as I possibly can. The price is expected to be less than $1,400 with it’s own camera. Here is a great night video with an earlier Phantom model. The Netherlands by a camera Armed Drone---Wow! Breaking News! Missing Aircraft Located!